Patrol 51, U-455 Hans-Heinrich Giessler, 4 days September 26-29, 1942. KorvettenkapitänHans-Heinrich Giessler brought his command U-455 on a four-day incursion into New England waters between the 26th and 29th of September, 1942. The boat appears to be stepping its way northeast from a position about 300 miles south of Montauk eastwards. Between the 27th and 28ththe boat headed north then east, and the same the following day – north then east. On the 29th U-455 exited the region about 150 miles south of Cape Sable Nova Scotia heading east. This patrol began on the 22ndof August in St. Nazaire France and ended there on the 27th of October. The primary purpose of the patrol was to mine the entrances to Charleston, South Carolina. Though Giessler achieved this feat, no ships are known to have struck the mines. He then proceeded to the Gulf of St. Lawrence and then Cape Race, Newfoundland, but found no targets there and returned to France (Uboat.net, Wynn, Vol. 1, p.303). Hans-Heinrich Giessler was born in January 1911 in Berlin and is by all accounts still alive at age 104 in October 2015. 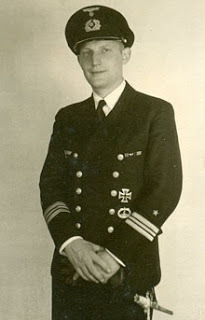 He was a member of the Crew of 1931 and in 1938-1939 served as 1stWatch Officer of the destroyer Z-16 Friedrich Eckholdt. He served in torpedo inspectorate until joining U-boats in March 1941. Giessler served as commander of U-455 between August 1941 and November 1942 and sank two ships for 13,908 tons over four patrols of 185 days. He was awarded the Iron Cross 1stClass. He went back to torpedo inspectorate, then in February 1945 became 1stWatch Officer of the destroyer Z-20 Karl Galster before being taken POW and released in March of 1946. Little is known of his career since the war (Uboat.net, Busch & Röll).